Background: Epithelial–mesenchymal transition (EMT) is actively involved in tumor invasion. The main hallmark of EMT is downregulation of the adherens junction protein E-cadherin due to transcriptional repression. Candidate E-cadherin transcription repressors are members of ZEB family, ZEB2 belong to the ZEB family transcription factor that is pivotal for embryonic development and tumor progression. ZEB2 (zinc finger E-box binding homeobox 2) is most widely known as an inducer of EMT. Growing evidence have shown the involvement of microRNAs in cancer progression. In this study, we demonstrate that miR-30a is a potent suppressor of melanoma metastasis to the lung. Materials and Methods: In this study, miR-30a has been transfected into B16-F10 melanoma cells, and then cells were injected intravenously into C57BL/6 mice. Then, the mice were sacrificed and nodules in the lungs were enumerated. Results: Ectopic expression of miR-30a in melanoma cell line resulted in the suppression of pulmonary metastasis. We also found that transfected miR-30a into melanoma cells could increase E-cadherin and decrease ZEB2 expression. Conclusions: Our findings showed that increased expression of miR-30a in melanoma inhibited metastasis in vivo by targeting ZEB2 and E-cadherin. Epithelial–mesenchymal transition (EMT) is a fundamental process in embryonic development and is actively involved in tumor invasion, tissue homeostasis, wound healing, and fibrosis., The most observed character of EMT is that the cells turn to be spindle-like morphology from the compact and well-arranged epithelial structure. The main hallmark of EMT is downregulation of the adherens junction protein E-cadherin due to transcriptional repression. Candidate E-cadherin transcription repressors are members of the Snail family, including Snail1 and Snail2, Twist, and ZEB family (ZEB1 and ZEB2)., ZEB2 belongs to the ZEB family transcription factor that is pivotal for embryonic development and tumor progression. ZEB2 is most widely known as an inducer of EMT, the process of converting from a mature epithelial-like state to an immature mesenchymal state with increased migratory and invasive behavior. ZEB2 expression can directly induce EMT in a variety of solid tumor types and can thereby promote metastasis., MicroRNAs (miRNAs) are short 20–22 nucleotides that exhibit a high degree of structural and functional conservation throughout metazoan species. Binding of miRNA to 3′UTR of the target mRNAs with perfect or near-perfect complementarity induces either translation suppression or degradation of mRNA, making them powerful regulators of gene expression in a variety of eukaryotic organisms. Recent reports have highlighted the importance of miR-200 as a powerful regulator of EMT in cancer cells. miR-200 family members directly target the 3′UTRs of E-cadherin transcriptional repressors ZEB1 and ZEB2. Ectopic expression of miR-200 led to upregulation of E-cadherin in cancer cells and reduced the cell motility. Conversely, loss of miR-200 expression enhanced the migration and invasion during cancer progression., However, the functional roles of a vast majority of miRNAs in the EMT process still remain unknown. Melanoma is the most aggressive form of skin cancer. The incidence of melanoma has become two folded almost every 10 years and is rising more rapidly than the incidence of all other malignancies, except for lung cancer. However, there is currently no curative therapy available, particularly for its advanced stages. Hence, the molecular mechanisms leading to the development and progression of melanoma are the focus of intense investigation. miR-30a, a member of the miR-30 family, has previously been shown to be downregulated in several cancers.,,, Since miR-30a expression is dysregulated in melanoma cell lines and melanoma specimens, it can be speculated that miR-30a may contribute to the development of melanoma as a tumor suppressor. Furthermore, it has been shown that miR-30a targets the 3′UTR of ZEB2 and inhibits EME. However, little is known about the contribution and underlying molecular mechanism of action of miR-30a in melanoma tumor metastasis. In this study, we investigate the effect of miR-30a on the ZEB2, E-cadherin expression, and the ability of melanoma metastasis in mice. The melanoma cells line B16-F10 (NCBI, National Cell Bank of Iran, Pasteur Institute of Iran) supplemented with 4 mM L-glutamine, 4.5 g/l glucose and 10% fetal bovine serum, and 0.1% penicillin/streptomycin. Then, cell lines were cultured under humidified air with 5% CO2 at 37°C. The miR-30a mimics as well as scramble miRNA were obtained (from Bioneer), their sequences were listed as follows: miR-30a mimics (5′-UGUAAACAUCCUCGACUGGAAG-3′) and scramble miRNA (5′-CAGUACUUUUGUGUAGUACAA-3′). Oligonucleotides (100 pmol/μL) were transfected into the cells at 80% confluence, using Lipofectamine 2000 according to the manufacturer's instruction (Invitrogen, USA). Then, B16F10 cells were seeded at a density of 5 × 102 cells/well in 6-well plates and grown for 24 h at 37°C in 5% CO2. 48 h after transfection, the cells were trypsinized and then suspended in phosphate-buffered saline (PBS) for quantitative real-time polymerase chain reactions (qRT-PCR) and mice injection. The study was reviewed and approved by the Ethics Committee of Isfahan University of Medical Sciences. All animal experiments performed in accord with the National Institutes of Health Guide for the Care and Use of Laboratory Animals. 4–6-week-old male C57BL/6 mice were purchased from Pasteur Institute of Iran. In order to acclimatization to the environment, the mice were housed 2 weeks before the experiment in a pathogen-free environment at 25°C under controlled lighting (12-h light/12-h dark cycles) and allowed free access to water and food pellets. B16-F10 melanoma cells were transfected with 50 pmol/μL miR-30a-5p mimic or scramble 24 h post seeding. After 24 h, 1 × 106 cells (from mimic, scramble, and nontreated controls) resuspended in 100 μL sterile PBS and were injected intravenously through tail vein (each n = 6). The day of inoculation was defined as day 0. By day 20, the mice were sacrificed, the lungs removed, rinsed with PBS, and fixed in a neutral-buffered formaldehyde solution. Nodules visible as black forms in the lungs were then enumerated. For qRT-PCR, RNA was prepared by TRIzol reagent (Invitrogen). Total RNA was processed to cDNA by reverse transcription using the High-Capacity cDNA Reverse Transcription Kit. Experiments were run on an Applied Biosystems 7900HT real-time PCR instrument using the SYBR green-based real-time PCR reaction kit, according to the manufacturer's instructions. The sequences of E-cadherin primers were forward: 5′-TCCTCGCCCTGCTGATTCTG-3′; Reverse: 5′-CTGGTCTTCTTCTCCACCTCCTTC-3′ and for ZEB2 Forward 5′-TCTCGCCCGAGTGAAGCCTT-3′; reverse: 5′-GGGAGAATTGCTTGATGGAGC-3′. Analysis was performed using the software supplied with the instrument. GAPDH forward primer: 5′-TGGAGAAACCTGCCAAGTATGATG-3′; Reverse: 5′-AGTGGGAGTTGCTGTTGAAGTC-3′ [Table 1]. The levels of E-cadherin and ZEB2 mRNA analyzed by qRT-PCR were normalized to that of GAPDH. Relative RNA expression was determined by calculating the mean difference between the cycle threshold (CT) of the mRNA of interest and the GAPDH RNA normalization control for each sample (ΔCT). Data (ΔCT) were averaged over independently replicated experiments and expressed as the mean fold change over the mean of the control group (2−ΔΔCT) ± standard error of the mean. Data are shown as the mean ± standard deviation. Statistical analysis was done with SPSS version 18.0 statistic software package (SPSS Inc., Chicago, IL, USA). Comparisons between multiple groups were performed by one-way analysis of variance. A value of P < 0.05 was considered statistically significant. One-way ANOVA and Mann–Whitney U tests for nonparametric analyses were performed for multiple group comparisons of the data. The data were subjected to post hoc Tukey test for significance of the differences in the mean values. To investigate whether miRNAs play a role in controlling ZEB2 expression, we integrated the results of the prediction software programTargetScan (http://www.targetscan.org/) and found that the 3′UTR of ZEB2 mRNA contained a potential binding site for miR-30a [Figure 1]. To examine whether miR-30 regulates ZEB2 qRT-PCR results demonstrated that transfection of miR-30a mimics significantly reduced the ZEB2 expression and upregulated the E-cadherin expression in B16F10 melanoma cells [Figure 2]a and [Figure 2]b. To further determine the in vivo effects of miR-30a on tumor metastasis, we used a classic in vivo model of melanoma lung metastasis in which transfected cells were injected into the tail vein of C57BL/6 mice. Twenty days after injection, mice were sacrificed and the lungs recovered for histology assessment. The number of metastatic nodules in the lung was dramatically decreased in miR-30agroups, compared with the negative control group [Figure 3], clearly demonstrating that miR-30a suppresses the ability of melanoma cells to extravasate or seed at a distant site. These findings indicate that miR-30a exerts a negative metastatic regulator on B16F10 cells invasion in vivo. In the present study, we found that the 3′UTR of ZEB2 mRNA contained a potential binding site for miR-30a and Our findings showed that increased expression of miR-30a in melanoma inhibited metastasis in vivo. Moreover, we identified ZEB2 as a functional target of miR-30a and expression of miR-30a significantly increased the expression of epithelial marker E-cadherin. EMT occurs frequently during normal development in processes such as mesoderm and neural crest cell formation. During tumor progression, EMT is also crucial for loss of cell polarity of epithelial cells, thus facilitating migratory and invasive behavior. The involvement of the transcription factor ZEB2 during EMT in developmental processes was indicated by the phenotype of the SIP1 knock-out mouse. Loss of ZEB2 expression was correlated with loss of the migratory capacities of neural crest cells. Retroviral insertion mutagenesis suggested that ZEB2 could contribute to oncogenic transformation. Furthermore, the upregulation of ZEB-family members during EMT was recently demonstrated. The E-cadherin promoter was previously identified as a direct target of ZEB2. ZEB2 binds to the E2-boxes (CACCTG) present in the E-cadherin promoter, resulting in downregulation of the promotor's activity. Recently, the study provides evidence that ZEB2 is one of the important effectors of this p53/miR-30a pathway. They demonstrate that the reduction in miR-30a expression elicited by p53 inactivation results in an alleviation of miR-30a-mediated targeting of ZEB2, which correlates with increased cell plasticity, migration, and in vivo dissemination. We integrated the results of the prediction software programTargetScan (http://www.targetscan.org/) and found that the 3′UTR of ZEB2 mRNA contained a potential binding site for miR-30a. In agreement with our results, downregulation of the miR-30 family has frequently been detected in various tumors, such as those of the colon, lung, breast, prostate, thyroid, acute myeloid leukemia, and liver,,,,,, in large-scale miRNA expression arrays., Furthermore, miR-30a has been found to increases E-cadherin expression and inhibit EMT process and is more frequently downregulated in several other metastatic cancers. In this study, we showed that increased expression of miR-30a in melanoma inhibited metastasis in vivo and increasing the expression of epithelial marker E-cadherin. Moreover, we identified ZEB2 as a functional target of miR-30a and a potential mechanism to suppress cell migration, invasion, and EMT changes. Our data suggest a fundamental role for miR-30a in EMT as well as migration and metastasis of melanoma cells. miR-30 family reduced ZEB2 expression and are among the highly downregulated miRNAs in metastatic cancers, implying a putative function of miR-30 in cancer therapy and metastasis. Our findings showed that increased expression of miR-30a in melanoma cells inhibited lung metastasis in mice by targeting ZEB2 and E-cadherin. Kalluri R, Neilson EG. Epithelial-mesenchymal transition and its implications for fibrosis. J Clin Invest 2003;112:1776-84. Thiery JP. Epithelial-mesenchymal transitions in development and pathologies. Curr Opin Cell Biol 2003;15:740-6. ElMoneim HM, Zaghloul NM. Expression of E-cadherin, N-cadherin and snail and their correlation with clinicopathological variants: An immunohistochemical study of 132 invasive ductal breast carcinomas in egypt. Clinics (Sao Paulo) 2011;66:1765-71. Vuoriluoto K, Haugen H, Kiviluoto S, Mpindi JP, Nevo J, Gjerdrum C, et al. Vimentin regulates EMT induction by slug and oncogenic H-ras and migration by governing axl expression in breast cancer. Oncogene 2011;30:1436-48. Cano A, Pérez-Moreno MA, Rodrigo I, Locascio A, Blanco MJ, del Barrio MG, et al. The transcription factor snail controls epithelial-mesenchymal transitions by repressing E-cadherin expression. Nat Cell Biol 2000;2:76-83. Peinado H, Olmeda D, Cano A. Snail, zeb and bHLH factors in tumour progression: An alliance against the epithelial phenotype? Nat Rev Cancer 2007;7:415-28. Baraniskin A, Birkenkamp-Demtroder K, Maghnouj A, Zöllner H, Munding J, Klein-Scory S, et al. 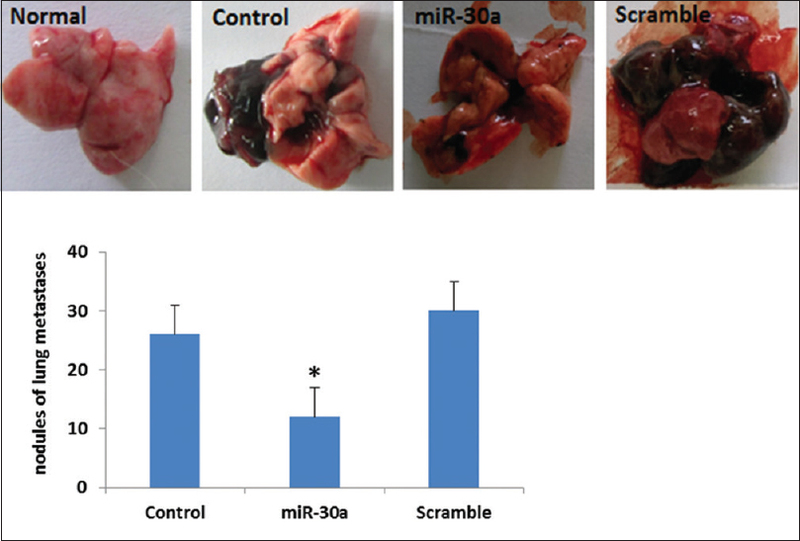 MiR-30a-5p suppresses tumor growth in colon carcinoma by targeting DTL. Carcinogenesis 2012;33:732-9. Comijn J, Berx G, Vermassen P, Verschueren K, van Grunsven L, Bruyneel E, et al. The two-handed E box binding zinc finger protein SIP1 downregulates E-cadherin and induces invasion. Mol Cell 2001;7:1267-78. Vandewalle C, Comijn J, De Craene B, Vermassen P, Bruyneel E, Andersen H, et al. SIP1/ZEB2 induces EMT by repressing genes of different epithelial cell-cell junctions. Nucleic Acids Res 2005;33:6566-78. Chen CZ. MicroRNAs as oncogenes and tumor suppressors. N Engl J Med 2005;353:1768-71. Korpal M, Lee ES, Hu G, Kang Y. The miR-200 family inhibits epithelial-mesenchymal transition and cancer cell migration by direct targeting of E-cadherin transcriptional repressors ZEB1 and ZEB2. J Biol Chem 2008;283:14910-4. Park SM, Gaur AB, Lengyel E, Peter ME. The miR-200 family determines the epithelial phenotype of cancer cells by targeting the E-cadherin repressors ZEB1 and ZEB2. Genes Dev 2008;22:894-907. Völler D, Ott C, Bosserhoff A. MicroRNAs in malignant melanoma. Clin Biochem 2013;46:909-17. Kao CJ, Martiniez A, Shi XB, Yang J, Evans CP, Dobi A, et al. MiR-30 as a tumor suppressor connects EGF/Src signal to ERG and EMT. Oncogene 2014;33:2495-503. Kumarswamy R, Mudduluru G, Ceppi P, Muppala S, Kozlowski M, Niklinski J, et al. MicroRNA-30a inhibits epithelial-to-mesenchymal transition by targeting snai1 and is downregulated in non-small cell lung cancer. Int J Cancer 2012;130:2044-53. He R, Yang L, Lin X, Chen X, Lin X, Wei F, et al. MiR-30a-5p suppresses cell growth and enhances apoptosis of hepatocellular carcinoma cells via targeting AEG-1. Int J Clin Exp Pathol 2015;8:15632-41. Zhang J, Zhang H, Liu J, Tu X, Zang Y, Zhu J, et al. MiR-30 inhibits TGF-β1-induced epithelial-to-mesenchymal transition in hepatocyte by targeting snail1. Biochem Biophys Res Commun 2012;417:1100-5. Di Gennaro A, Damiano A, Brisotto G, Armellin M, Perin T, Zucchetto A, et al. A p53/miR-30a/ZEB2 axis controls triple negative breast cancer aggressiveness. Cell Death & Differentiation, 2018: p. 1. Van de Putte T, Maruhashi M, Francis A, Nelles L, Kondoh H, Huylebroeck D, et al. Mice lacking ZFHX1B, the gene that codes for smad-interacting protein-1, reveal a role for multiple neural crest cell defects in the etiology of hirschsprung disease-mental retardation syndrome. Am J Hum Genet 2003;72:465-70. Mikkers H, Allen J, Knipscheer P, Romeijn L, Hart A, Vink E, et al. High-throughput retroviral tagging to identify components of specific signaling pathways in cancer. Nat Genet 2002;32:153-9. Jechlinger M, Grunert S, Tamir IH, Janda E, Lüdemann S, Waerner T, et al. Expression profiling of epithelial plasticity in tumor progression. Oncogene 2003;22:7155-69. Yang SJ, Yang SY, Wang DD, Chen X, Shen HY, Zhang XH, et al. The miR-30 family: Versatile players in breast cancer. Tumour Biol 2017;39:1010428317692204. Chang CW, Yu JC, Hsieh YH, Yao CC, Chao JI, Chen PM, et al. MicroRNA-30a increases tight junction protein expression to suppress the epithelial-mesenchymal transition and metastasis by targeting slug in breast cancer. Oncotarget 2016;7:16462-78. Liu Z, Tu K, Liu Q. Effects of microRNA-30a on migration, invasion and prognosis of hepatocellular carcinoma. FEBS Lett 2014;588:3089-97. Yu Y, Yang L, Zhao M, Zhu S, Kang R, Vernon P, et al. Targeting microRNA-30a-mediated autophagy enhances imatinib activity against human chronic myeloid leukemia cells. Leukemia 2012;26:1752-60. Zhang N, Wang X, Huo Q, Sun M, Cai C, Liu Z, et al. MicroRNA-30a suppresses breast tumor growth and metastasis by targeting metadherin. Oncogene 2014;33:3119-28. Dixon-McIver A, East P, Mein CA, Cazier JB, Molloy G, Chaplin T, et al. Distinctive patterns of microRNA expression associated with karyotype in acute myeloid leukaemia. PLoS One 2008;3:e2141. Porkka KP, Pfeiffer MJ, Waltering KK, Vessella RL, Tammela TL, Visakorpi T, et al. MicroRNA expression profiling in prostate cancer. Cancer Res 2007;67:6130-5. Schetter AJ, Leung SY, Sohn JJ, Zanetti KA, Bowman ED, Yanaihara N, et al. MicroRNA expression profiles associated with prognosis and therapeutic outcome in colon adenocarcinoma. JAMA 2008;299:425-36. Visone R, Pallante P, Vecchione A, Cirombella R, Ferracin M, Ferraro A, et al. Specific microRNAs are downregulated in human thyroid anaplastic carcinomas. Oncogene 2007;26:7590-5. Yan LX, Huang XF, Shao Q, Huang MY, Deng L, Wu QL, et al. MicroRNA miR-21 overexpression in human breast cancer is associated with advanced clinical stage, lymph node metastasis and patient poor prognosis. RNA 2008;14:2348-60. Yanaihara N, Caplen N, Bowman E, Seike M, Kumamoto K, Yi M, et al. Unique microRNA molecular profiles in lung cancer diagnosis and prognosis. Cancer Cell 2006;9:189-98. Garzon R, Volinia S, Liu CG, Fernandez-Cymering C, Palumbo T, Pichiorri F, et al. MicroRNA signatures associated with cytogenetics and prognosis in acute myeloid leukemia. Blood 2008;111:3183-9.